Myself and Nicola are currently at The Celtic Manor Resort to attend a black tie event arranged by my employers. Before we checked in yesterday, we had a few hours to kill so spent a little time in Cardiff city centre. Neither of us have ever been to Wales so we seen this as an opportunity to a do little research for a possible future city break. Our whistle stop tour of the city centre certainly gave us enough reason to come back and spend more time, with a huge range of shopping, tourist stuff and loads of places to eat and drink. It made sense that we stopped for lunch before we left the Welsh capital and after checking the menu boards of the usual suspects of national chains (Wagamama, Ask, Carluccios, Pizza Express etc), as well as an excellent array of independent bars, bistros and restaurants, we decided to to get in out of the rain and try lunch at Mocka Lounge. 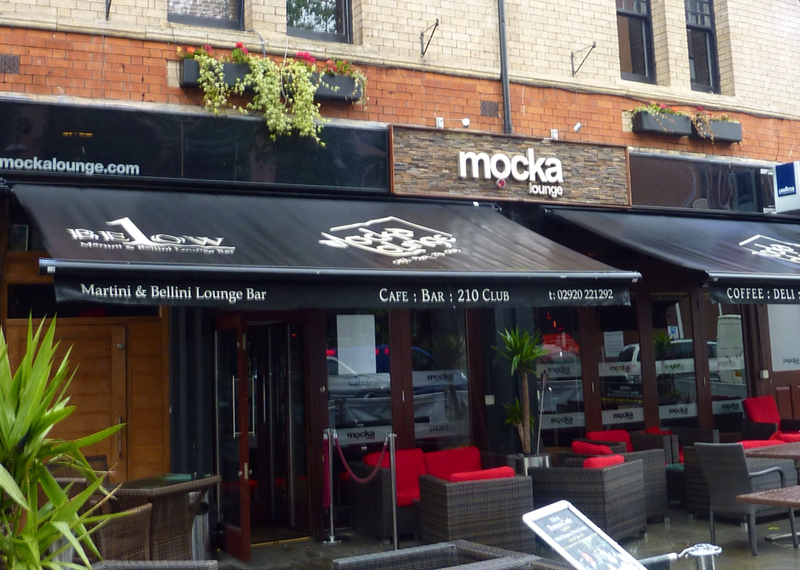 The general feel of Mocka Lounge is laid back and funky, with black and red being the main colouring both inside and out. The menu offers a good range of snack and light bites and main course choices but as we would be having a full three course meal later in the evening, we kept our lunch simple with Nicola ordering the chicken club sandwich and me ordering the bacon cheeseburger, both coming with chips. From a presentation point I can't fault Mocka Lounge, the burger was stacked high and accompanied by thick hand-cut chips served in a little replica frying basket, all on top of a wooden serving board. It's not the first time I've seen chips served this way but you know what, I love little quirky ways of making the food look fun. As for the burger itself, where do I start? A 6oz home made burger, well seasoned and cooked perfectly, topped with mozzarella, bacon, lettuce, tomato, and a lovely piquant tomato chutney. 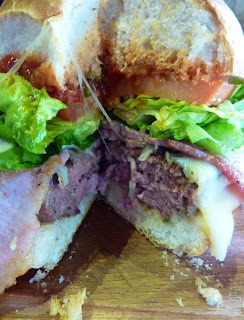 The burger was cooked well and deliciously, the smoked bacon worked well with the mozzarella although I would have preferred the bacon to be crispier! The only other criticism that I have is that the toasted burger bun was a little dry. I think this juicy and well stacked burger would have worked much better with a nice floury bap, but overall it was still a very good cheeseburger. 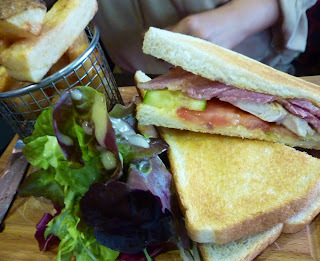 As I tucked into my burger, Nicola started to make good headway into her club sandwich. The traditional club sandwich is served with three pieces of toasted bread, but Mocka used huge slices of a thick white bloomer and only used two slices. Perhaps a little unconventional, but what was served was well filled with lots of thick sliced roast chicken, plenty of smoky bacon, sliced tomato and pickled cucumber slices. 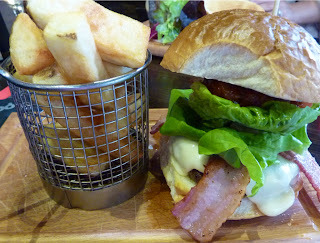 As I mentioned earlier, this was served with the same thick cut chips that I had. In Nicola's words, "these chips are magic " and although there was no sign of Paul Daniels about, was there anything left on our plates? Not a lot! Whilst we enjoyed our lunch, I noticed that there were card on the table offering a 20% discount on our bill in return for us completing a feedback form. This is a fantastic idea as I think every restaurant should be encouraging customers to be giving feedback in order for them to gauge response and make improvements where necessary. I happily filled our own feedback card in and asked for the bill, happy to see that the 20% discount had been applied but less happy to see that an "optional 10% service charge" had been added! Don't get me wrong, I'm all for tipping waiting staff when I dine out, I'm just not happy on a charge being added regardless, especially when there were only two of us dining. I would have been tipping anyway, possibly more than the equivalent of 10% but by automatically adding it, I gave no further tip. 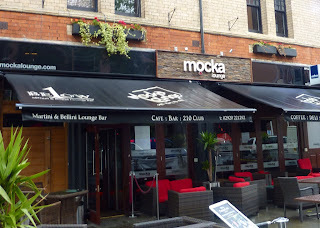 So to sum things up, would I go back to Mocka Lounge? The answer is yes! 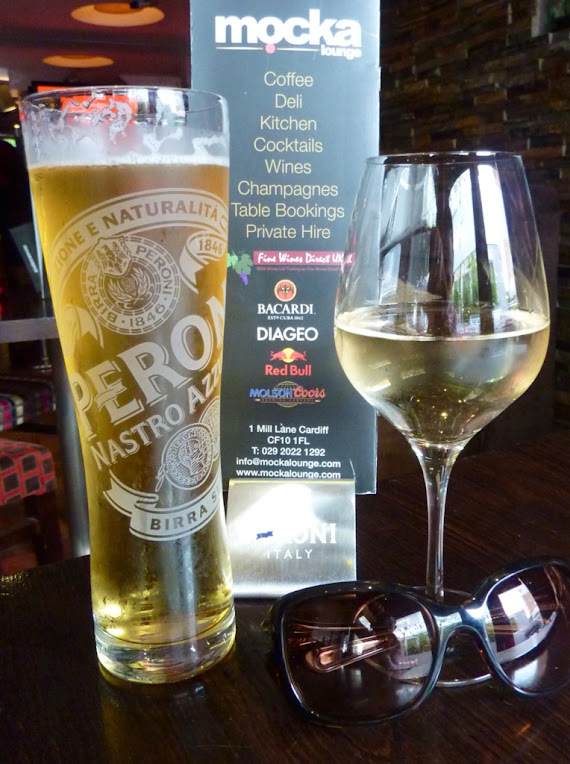 The food was well priced, well flavoured and good value for money, whilst the service was efficient, polite and attentive. Myself and Nicola hope to come back to Cardiff in the coming months and we will definitely be back to Mocka Lounge.